Recently I performed at a memorial service organized by a local high school’s Class of 1965 honoring one of their classmates who was killed in the Vietnam War. The importance of this gathering in the eyes of the participants was very touching and it caused me to give some thought to some of the ways in which the bagpipe is best used at events of this kind. The classmates and guests at the recent memorial were to arrive in the half-hour prior to the published start time that morning and my job was to set the tone with some appropriate music. The service took place at a local cemetery where a large tent had been set up next to the memorial stone which they had created. The tone of the event was thoughtful and contemplative and my choice of music was intended to compliment this. I began with the traditional Scots funeral march “The Flowers of the Forest”, and then transitioned into the lovely American melody “Going Home,” often heard in Dvorak’s “New World Symphony”. There are a number of Christian hymns which I find are particularly nice on the highland bagpipe and so my next set included “How Great Thou Art,” “Abide With Me,” “Nearer My God to Thee,” and lastly the Welsh hymn “Hyferdol.” To signal the start of the service, I chose to use “God Bless America” which comes off very well on the highland pipe and which fit the spirit of the gathering perfectly. Physical placement for the piper at a gathering of this kind is critical – the desired effect is for the music to linger in the background, blending in with the lovely setting, not so much to dominate the gathering, but to compliment it. Consequently, I selected a spot some 200 feet from the assembly tent so as to produce the right “volume” for the instrument. At this memorial, my role was to set the stage prior to the service. At others, I have used the bagpipe to mark the actual start of the event by leading an opening procession, often inside a church or funeral chapel. 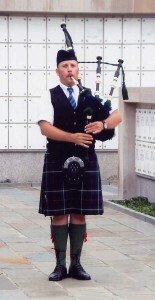 In this role, the bagpipe has a remarkable ability to capture the attention of the congregation and stir the emotions in a way that few others can match. At other memorial services, I have often been asked to play a piece of music as part of the program itself, often at mid-point in the proceedings, and often a tune which had some special significance for the honoree and their family. At still other memorial services, I have used the bagpipe to bring closure, marking the end of the service in a meaningful way, often times leading a procession of the family out of the venue. 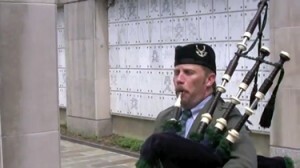 There a number of ways, in my view, to effectively use of the highland bagpipe at memorial services – setting the tone, marking the start, paying tribute, and bringing closure – in these roles the instrument’s unique ability to tap into the emotions of the listener often make it the perfect compliment to the gathering.